The bolted time capsule 3000 is our best designed time capsule box. 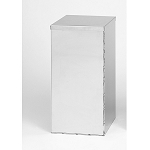 It not only looks good, but it's easy to work with, easy to close, and can be buried easily without any vault. There is no other seal on the market as good as this one. There's a machined o-ring groove, and our silicone o-rings fit the groove exactly right. Stainless steel bolts go down through the lid, but not into just any holes. They go down into "blind" holes. This means they're capped off underneath so that there is NO WAY any moisture can get through to the inside of the container. And it is the inside of the time capsule that will hold your own carefully chosen items. Bury or place them for 100 years or more. Bolted time capsules are special order and take time (up to 6 weeks) to make. The sealing kit you get with this one includes the formed silicone O-Ring, 12 stainless steel bolts and washers, and instructions. 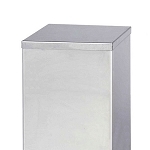 The finish on these time capsules is a satin, and welds are shined - but if you need an art piece or mirror finish polishing, we do offer that as an additional option, priced by size. A popular option is Laser Engraving for the lid of this time capsule. For these designs you have a circular area on the lid - see our examples in the gallery. 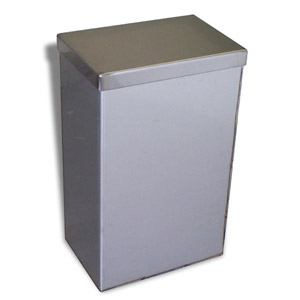 Our stainless steel capped time capsules are perfect archival boxes for most anything. They're made by hand. The personality? They were born in January, so they're practical, and great for organizing. If the time for your interment is 75 years or less, this is the best choice. You can also bury these easily (use the included instructions and kit). 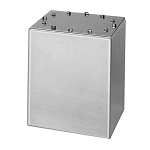 Made of the same basic sturdy stainless steel construction as the Bolted, our Capped Time Capsules differ in the way that they seal. It's a simple seal using silicone sealant and friction fit lid. You get a special sealing packet with silicone sealant, instructions, burial tips and recommendations, and a warranty. We made this style first as a container inside of a building's cornerstone. The style is versatile and can be customized to almost any dimension (call our office if you need a specific size). These time capsules are stainless steel and may also be buried if common sense conditions are provided (for instance, the capsule should be oriented up & down so that the cap is in the upright position). Other common sense considerations should be followed if you bury any time capsule, such as 'DO NOT bury in a regularly watered area' and other tips and recommendations included with your order. 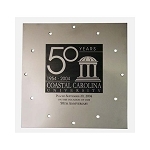 The time capsules have a satin finish, and welds are polished.A popular option is Laser Engraving for the time capsule lid. See our pricing for Laser Engraving and our Laser Engraving Gallery for ideas on what to say and how it might look. You'll get a limited warranty with each of our box time capsules. Also included is the Write-On Silver Poly Time Capsule label. In addition, we calculate an amount of Oxygen Absorbers and Desiccant conditioners, and this is included. The amount depends on the time capsule size. A starter packet of stationery is included as well as all 3 of our time capsule info pamphlets, and an inventory sheet. You get a sealing kit too, and that varies depending on the style.